Water Diverted From Creeks and Streams to Grow Marijuana – Whether Legal or Not – Means Less Water for Fish, Habitats and People. California law enforcement authorities over the past two weeks have eradicated nearly 65,000 illegal marijuana plants in various locations across the north of the state. The enormous haul suggests the marijuana industry is managing to stay healthy despite the drought – by illegally diverting water from its normal course. The largest operation took place on and close to Yurok tribe lands near Weitchpec, along the Klamath River. It began on July 14 and continues this week, due to a massive clean-up effort required at some of the illicit grow sites. More than 55,000 plants were removed at 22 illegal plantations, along with elaborate, prohibited water diversion systems, makeshift camps, fertilizers, herbicides and pesticides. One site was described as an “environmental disaster,” the area littered with abandoned vehicles, 20-plus broken car batteries and several cubic yards of household waste. Numerous tires, refrigerators and piles of grow-related garbage were also found on the property, which had recently been illegally buried by the growers to cover up the toxic debris. The operation involved officers from the tribal police force, the National Guard, the California Department of Fish and Wildlife, and the Humboldt County Sheriff’s Office. It was triggered, in part, by a realization among tribal residents that their water sources were drying up, and not just because of California’s severe drought. Many of these grows are diverting water from the same creeks that feed the tribe’s community water system, which are critically low already. At five of the illegal grow sites, tribal officials said growers diverted the entire flow of different creeks. 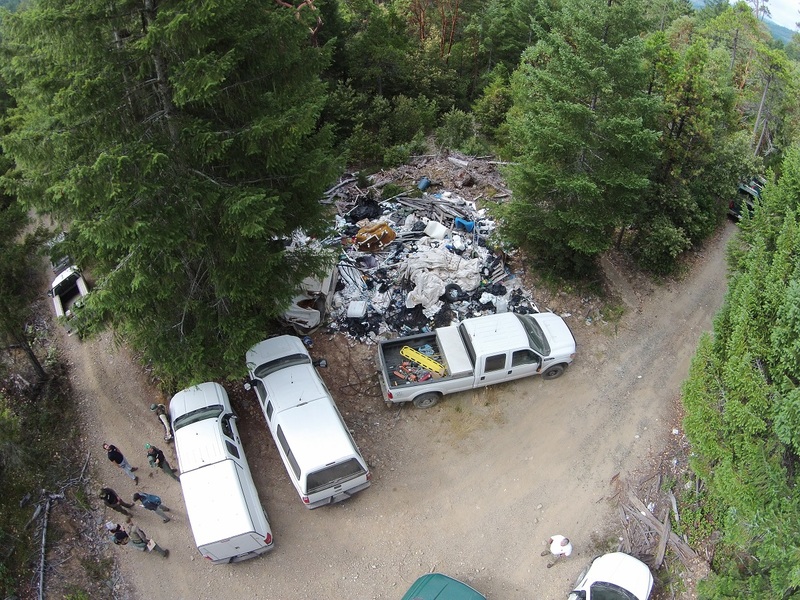 Authorities converge on a massive garbage dump attached to an illegal marijuana grow on Yurok Tribe lands in July 2015. The Yurok Tribe is the largest federally recognized tribe in California. In the past five years, tribal officials say, a deluge of clandestine cannabis growers from all over the United States has moved to lands within and adjacent to the Yurok Reservation. The combination of the mountainous terrain and minimally funded law enforcement has made it a desirable destination. At one site, cleaned up by the tribe and the California National Guard, it cost $30,000 to remove tons of trash, dismantle hundreds of yards of hose and properly dispose of hazardous chemicals. A mature marijuana plant consumes an estimated six to 12 gallons of water per day. The illegal water diversions are also impacting crucial cold streams that are critical for fish health. Currently, the temperature of the Klamath River is nearly 75 degrees Fahrenheit, tribal officials said, a significant threat to salmon starting to migrate upriver to spawn. High numbers of the fish are already waiting at the creek mouths, where it is up to 20 degrees cooler, to regulate their body temperatures. In times of drought, these fish could not survive without these cold water refuges. On Thursday, tribal fisheries biologist found that salmon in the lower Klamath River are infested with a potentially deadly disease. Called “ich” (short for Ichthyophthirius multifiliis), the pathogen thrives in warm water and this year appeared a month earlier than in 2014. It was the primary cause of death for more than 35,000 adult salmon in the river in 2002, an event that prompted severe fishing restrictions to preserve the salmon population in subsequent years. Another major marijuana bust occurred Monday in Butte County, near the town of Inskip. Officers from the Butte County Sheriff’s Office and State Department of Fish and Wildlife destroyed more than 9,000 marijuana plants. They arrested one suspect, Andres Hernandez-Farias, 41, of Mexico, who attempted to escape after he allegedly was found sleeping in a tent on the site. The Department of Fish and Wildlife estimates there are about 50,000 small marijuana farms in California, largely triggered by a 2011 state law allowing possession and cultivation of marijuana for medicinal purposes. Strong demand from municipal and recreational users, however, has created lucrative markets for illegal growers. A study in March by biologists at the Department of Fish and Wildlife concluded that water demand for marijuana cultivation was enough to take more than 100 percent of the water flow in four creeks they analyzed.